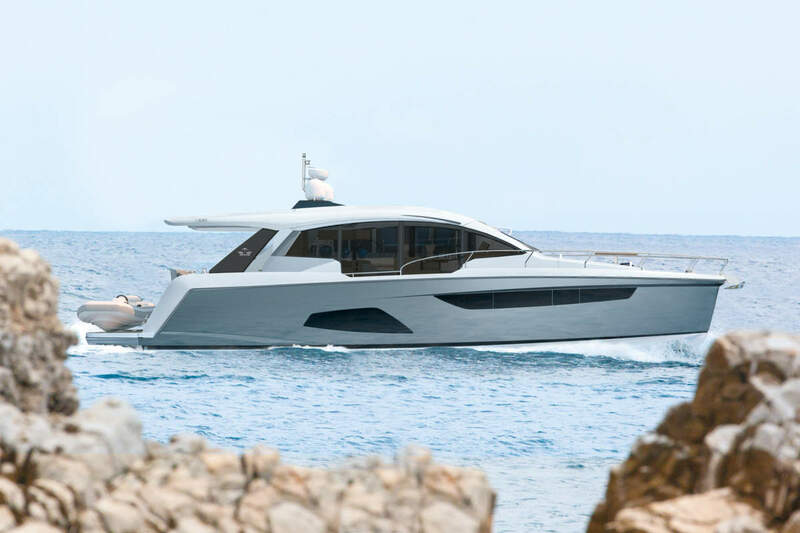 While preserving some of the main features that turned the Ferretti 830 into the most successful model in the Ferretti Yachts range, the Ferretti 870 Project also features some innovative design solutions already found on the Ferretti 800, thus following in the wake of one of the shipyards most largely appreciated recent models. Indeed, this new project is characterised by the bronze top above the helm station and by large windows both on the main deck and in the hull. The hull in particular features not only two large open view windows at the master cabin’s level, but also large opening portholes in the guest cabins and two windows in the fore VIP cabin, resulting in extraordinary indoor brightness and offering wonderful views. The glazing on the main deck has been enlarged with respect to the 830 and is now higher and longer, thanks to the lower gunwale amidships: a solution normally found on much larger yachts, which further increases visibility from the inside. Indeed, the glazing now reaches the stern, resulting in more continuous, harmonious lines and in a sleeker, longer profile. The yachts outer look is thus characterised by outstanding lightness, elegance and aggressiveness, also thanks to another distinctive feature of several Ferretti models: the three “shark branchiae” windows separating the saloon’s glazing from the helm station’s one. “This new project is a significant step forward in the large boats range – explains Alessandro Tirelli, Ferretti Yachts’ Brand Manager. On the Ferretti 870 we have kept unchanged all the strengths of its predecessor, particularly the rational space arrangement. The exterior design has been improved considerably, drawing inspiration from the brands most recent models and by exploiting the longer superstructure to the fullest – a solution which has also allowed us to radically modify the interior layout, to the benefit of onboard space and comfort. All guests can now enjoy some innovative, brilliant layout solutions on this over-26-metre craft ensuring outstanding performances, noiseless cruising and the utmost privacy”. 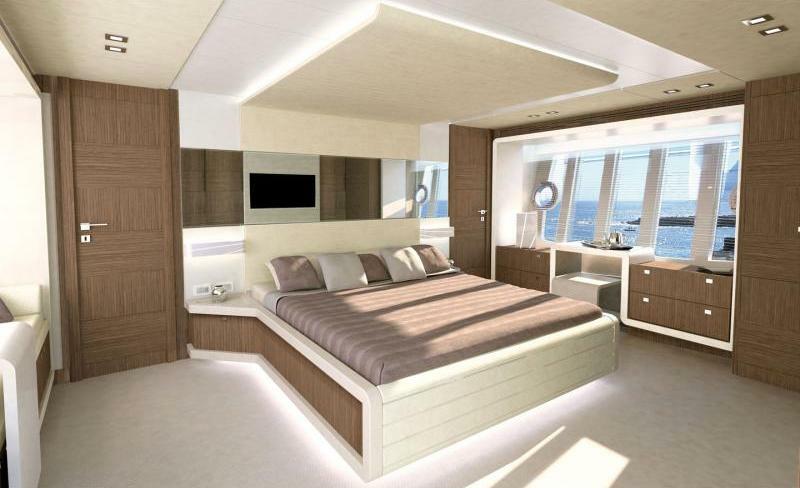 As far as interior finishes are concerned, the Ferretti 870 Project is characterised by refined walnut stained natural oak wood, which can also be found in the furnitures doors and drawers featuring lacquered tops and frames. 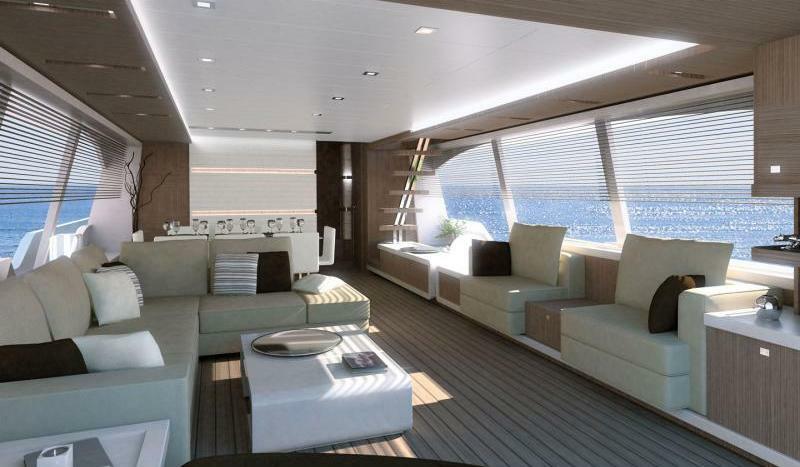 Below deck, wood is combined with leather, which has been used to furnish all cabins. The increased length of the new vessel can be immediately perceived in the cockpit, which is so wide it can really be considered as an outdoor lounge where time can be pleasantly spent in good company: indeed, the teak table seating six/eight people has been joined on this boat by a functional bar unit on the port side, beside the glazed door leading to the saloon. On the main deck, the living area, the dining area, the galley and the helm station have been effectively separated from one another: the latter two are located at bow, completely divided from the rest of the boat. The wide saloon features a large L-shaped sofa on the left hand side, as well as a comfortable armchair and a smoke-shade lacquered table. On the right there are two more armchairs separated by a cabinet and, behind them, a hiding TV set. 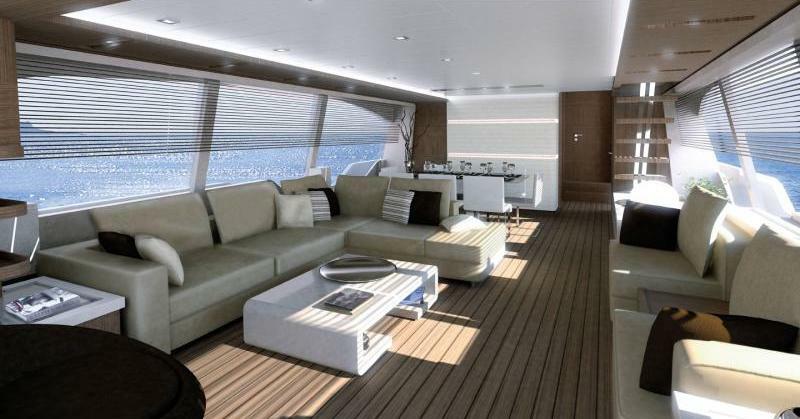 Continuing towards the bow, the glass dining table standing on the left can comfortably seat eight people; on the right hand side, a functional cupboard can be found just under the indoor staircase giving access to the flybridge. Another small cabinet behind the sofa and next to the table provides more storage space. The central part of the deck has been redesigned by introducing some brilliant solutions that optimise the interior layout, ensuring improved liveability and increased comfort and privacy for guests. A real lobby has indeed been obtained, from which a step and a door lead to the bow area. 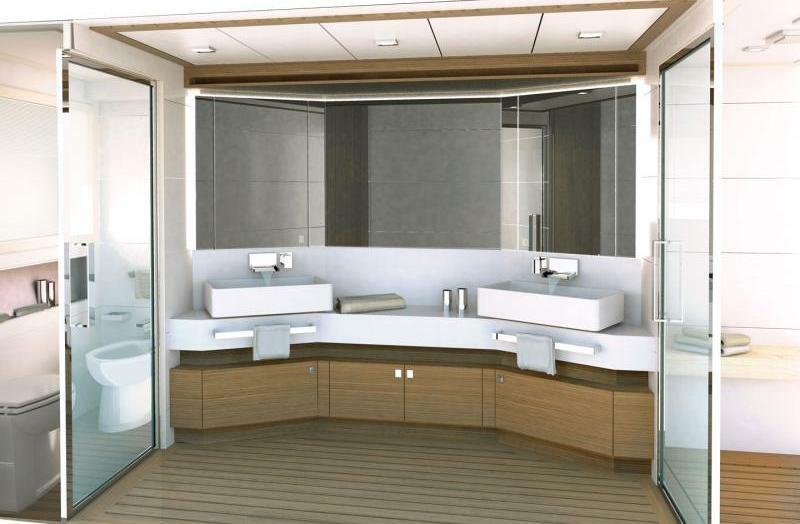 A sliding door on the port side provides access to the galley, while the day toilet and the stairs leading below deck can be found along the right wall. The galley and the helm station have been extensively modified too. The pilot house, featuring a new design, is now located on the right, a solution which provides easier access to the galley. 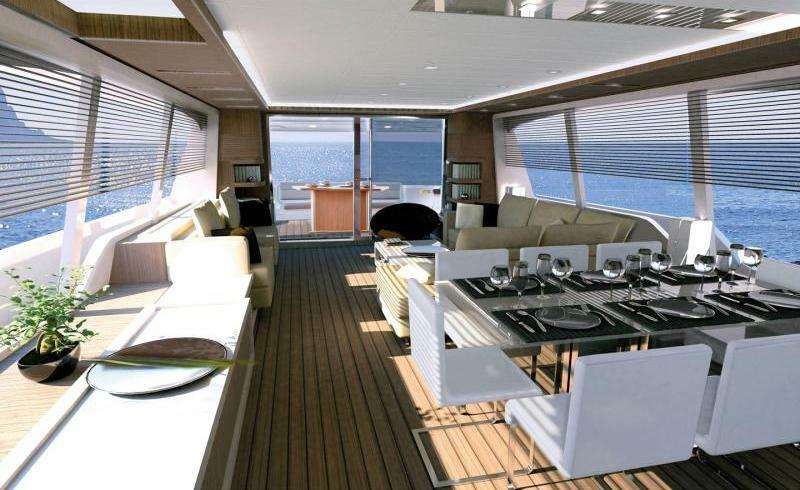 On the left, a comfortable dinette with an L-shaped sofa and a chart-table allow the owner to actively share the course with the helmsman. A door located behind the dinette leads to the galley, signed by Ernestomeda. The galley can also be reached from the outside, thanks to a door along the port side deck which can be used by the crew in order not to cross the saloon. On the lower deck too the new project makes the best of this vessel’s increased volumes, mainly to the benefit of the interior layout, also thanks to the shifting of all guest cabins towards the larger and therefore more comfortable stern area. This solution has not required any changes to the engine room, the crew quarters and the garage, but definitely results in a wider master stateroom and a larger port guest cabin. 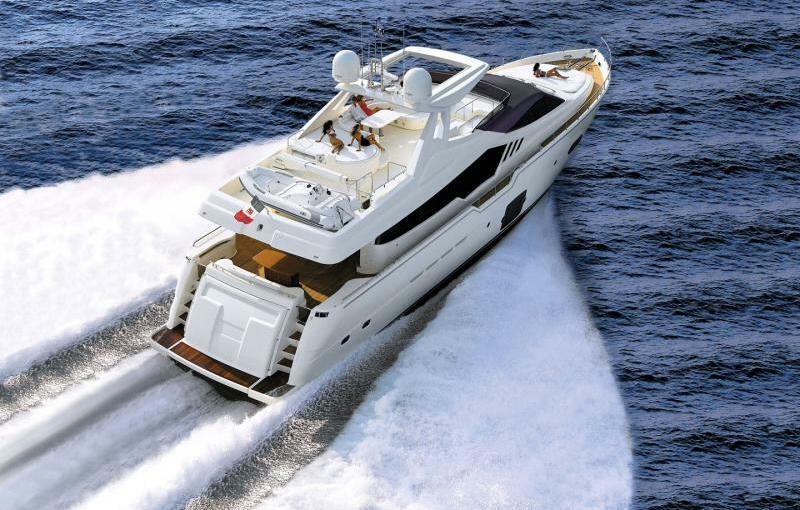 Similarly to the Ferretti 800, the Ferretti 870 Project features three double cabins (in the guest cabin the beds can be separated), plus a fourth cabin with twin beds. All cabins have their own en-suite head and separate shower box. The master cabin on the Ferretti 870 Project has been entirely redesigned and repositioned and is now a true full-beam cabin, incredibly bright thanks to the double glazing with portholes and finely furnished with a sofa standing along the entire length of the glazing and a sliding table. A vanity unit is located under the opposite glazing. All pieces of furniture have walnut stained oak wood doors and drawers, and lacquered tops and frames. 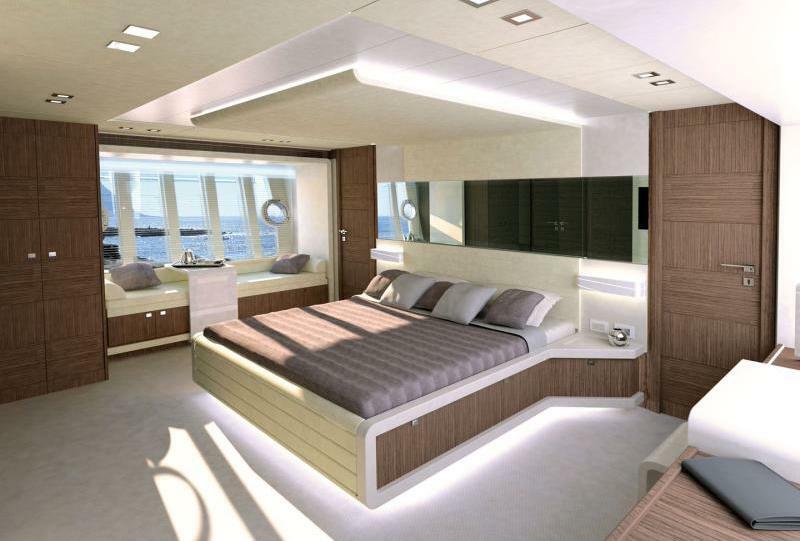 More in general, the lower deck decor makes an extensive use of wood and leather for beds and headboards. The master bathroom features two Corian washbasins supported by a marble top. Access to the shower is gained through a glass door, while the sanitary ware area is separated from the rest of the bathroom by a sliding door. The position of the head and the walk-in wardrobe, behind the bed, reduces noise considerably, since the cabin is now separated from the engine room by these rooms, a soundproof partition and the tanks. Moreover, to ensure improved comfort and privacy, the crew quarters have been located aft, beyond the engine room, which the sailor can now also access directly. The guest cabins have also been considerably improved, resulting in increased available space and larger glazing which ensures an incredible brightness. The fore VIP cabin has two windows with a porthole, under one of which – on the starboard side – stands a comfortable sofa. This cabin too stands out for its wooden surfaces and leather headboard and ceiling wings. A vanity unit is located against the port wall. The guest cabins are extremely bright too, thanks to a large glazing with two portholes. 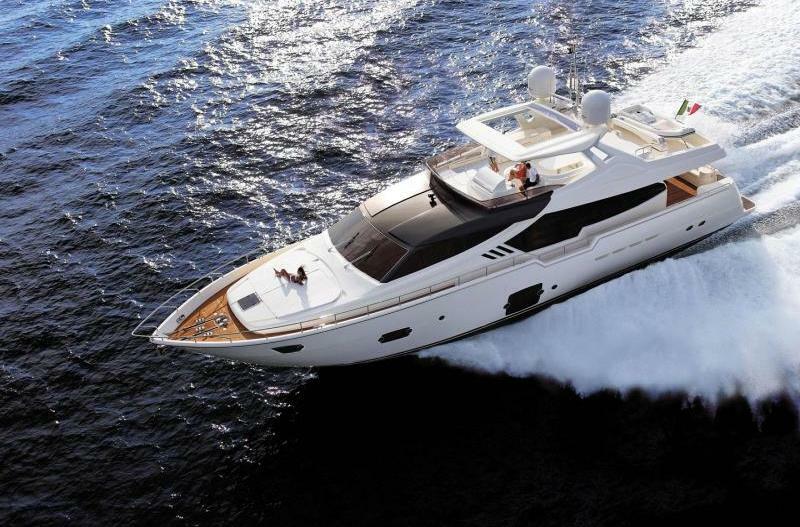 As regards performances, the new Ferretti 870 Project is equipped with two 12V 2000 M94 MTU engines having a power of 1948 mph at 2450 rev/min. and allowing it to reach a cruising speed of 27 knots and a maximum speed of 30.5 knots. At the maximum speed, the boat has a range of 300 nautical miles, which increases to 358 nautical miles at cruising speed. Well if I had the ferrari and the ferretti i dont think i would be racing them, looks like a fantastic sports yacht though, must admit the italians do it very well when it comes to luxury and flash appeal!